Kira Is Wearing: The white shirt, reinvented. And here is a normal way to wear the same shirt, much more boring, right? Hope you liked another shoot made by my mum in Riga. This beautiful cathedral is located literary 30 seconds away from our home in the Old Town, how cool is that? I love very simple pieces, but find it very hard to pull them off (red lipstick usually helps), so this time I decided to try something new without spending more. I've added black nail polish and few very simple accessories, including the Leo pedant. That's where the good news start! 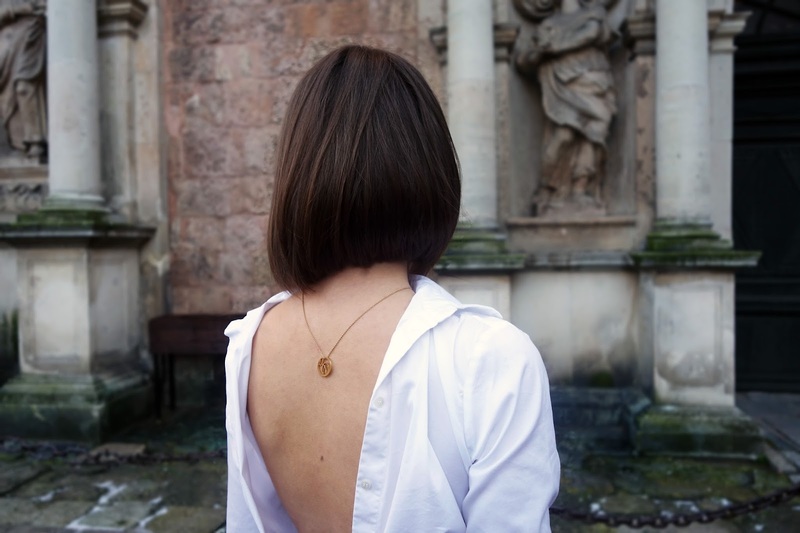 I've teamed up with Danish jewellery brand Jane Kønig to give away another star tag of your own sign. Interested? Then head over to my Instagram:) The competition is open internationally! Really hope you'll participate! I'm @justplaincrystal from Insta,and I just want to say you are beautiful,and absolutely such an inspiration to me.Thank you,so so much.Have a lovely holiday season.Much love and blessings. P.P.S. your blog is amazing - would you like to follow each other? Love this backless look soo much, pinning now! Как нежно и трепетно! Чудесная идея с рубашкой! Great creativity Kira. I love this new way to wear the shirt and I'll keep it in mind for this Spring! I saw a preview shot of this look on your Instagram and instantly thought how luxurious and chic it looked - the open back shirt is everything and what gorgeous jewellery! Wow, what a cool way to take a classic piece and make it fresh again! I love how you've styled your jewelry with it as well. Beautiful as always! Love it, so original! You look amazing Kira!! I am so loving this simple look. And I am definitely loving these photos as well. The cathedral looks amazing. Love this super chic top! OMG I love this look so much! I fell in love with it on your Instagram and it's the first time I see the complete outfit, love it!